“Sometimes I really miss Great-Grandma,” Joshua said as I tucked him into bed. My Grandmother had been gone for years. The holidays seem to make us miss loves ones who are gone even a little bit more. It is the night before Thanksgiving Day and we find ourselves in a country that our forefathers seemed quite thankful to leave. There’s a bit of irony. But, we’ve found ourselves surrounded by so much warmth, love, friendship. Any sadness at being away from family during the Thanksgiving holiday was quickly softened by the wonderful invitations for Thanksgiving meals–yes, plural. Rob is guest preaching at an American Thanksgiving Day service in nearby Hexham. One of the ministers invited us to stay for a Thanksgiving Dinner (his wife is an American). I promised to make my grandmother’s chocolate pie. I went down to the kitchen and gathered my supplies. Should I top it with a meringue? “No, of course not,” I laughed to myself. I could hear my dear Pawpaw saying, “Don’t put that cow slobber on my pie!”, in his rich East Texas voice. I’d helped my grandmother make her chocolate pie many previous holidays. I laughed as I recalled the story she had related to me of one particular Easter when my dad was little. The Easter Bunny had brought my dad and my uncle tiny Easter chicks. REAL Easter chicks. We’re not talkin’ marshmallow Peeps, people. These were cute, little, fluffy chicks. My grandmother had carefully prepared her chocolate pie for Easter Dinner after church and left it on the counter to cool. She took a quick glance at the two tiny chicks huddled in the corner of the shoebox and her farm-girl instincts told her that they needed warmth. As they hurried out the door to church, she loving placed the shoebox with the chicks on the back of the still-warm stove. And now, far away in my kitchen in England I attempted to prepare her chocolate pie. As I nearly finished putting the recipe together from memory, I realized I was forgetting an ingredient. It didn’t look right. It wasn’t the same as Grandma’s. 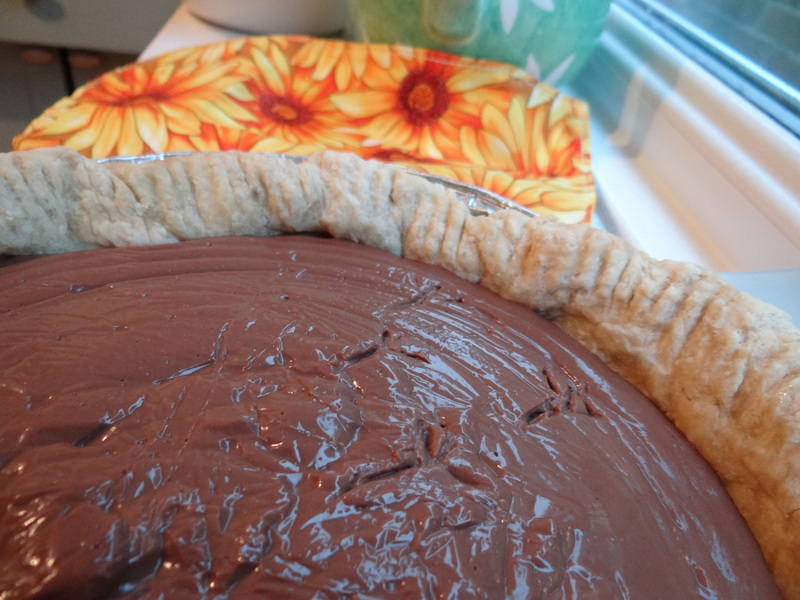 I recalled her voice guiding me along those other pie-making days, saying, “Now it needs a bit of butter.” I stirred two table spoons of cold farm butter into the steamy chocolate. Ah Ha! That was it. My Grandma’s Chicken Foot Chocolate Pie was complete. This Thanksgiving, give thanks for the memories that you have built–and are building–with loved ones. This includes the funny ones and the frustrating ones. Often times the frustrating ones become the funny ones. Such memories can shorten the distances of time and space. Such memories become fond ones for which we can give thanks for their effect on the present and the eternal. I still like to “decorate” my chocolate pies so that it lives up to its name. Mix the first five ingredients together in a cold sauce pan with a whisk. Mix very well. Place on low heat and slowly bring to a boil while constantly whisking. When it begins to thicken remove from heat and fold in the chocolate chips and vanilla. Mix until fully melted. Add butter last folding and mix in. Pour into a prepared pie shell and chill in the refrigerator completely. Top with whipped cream. Never meringue 😉 Decorate with tiny chicken footprints. David & I pray you have a wonderful day making new memories! Thank you so much. We did!